On our T-Mobile account there are four people; my wife, my pops, my moms, and myself. While I was reviewing the bill I saw a number that made me want to make a graph (probably happens to you all the time too). Look at the results for texts. 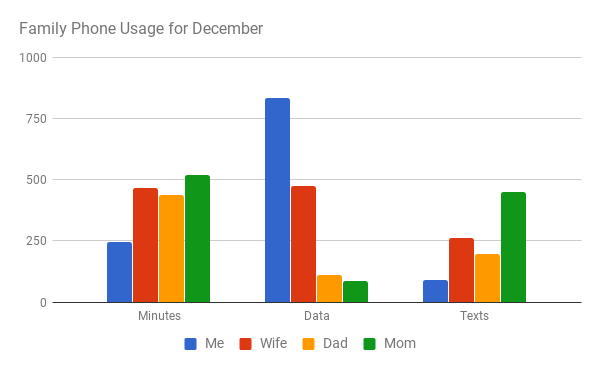 Of all the texts used in December, my mom used 49%!! No worries as the texting plan is unlimited, but I just thought it was funny that she is obviously a rabid crazy texting monkey. I probably should have seen this coming since whenever she sends me a text it either comes in multiple parts because it is too long to send in one, or I do not reply quick enough so several additional texts are sent to see if I received the first one. In fairness, the results for my texts are skewed since I use Google Voice to send and receive texts and I could not find an easy way to pull out the actual number. I did discover that I have 1566 texts in my inbox going back 17 months, so I guessed I could average about 92 texts a month, maybe, seems high to me though. If that is the case then I must have millions of messages in GTalk... either way I think the data certainly shows what my opinion of texting is; it's for moms and kids... bad asses don't send texts, we GTalk or punch suckers in the mouth to tell stories. Sorry mom, -2 BAPs for texting.